Melt 2 T butter, add 2 T flour and stir constantly. Remove from heat and whisk in 2 cups chicken broth and 2 cups of milk. (fat free) Return to medium heat and cook until sauce is thick and bubbly. Pour over veggies in baking dish. Season to taste with salt and black pepper. Make biscuits following directions on Bisquick box. 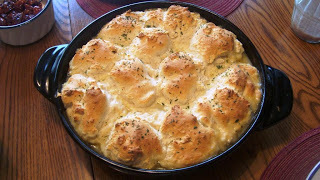 Drop biscuits on top of filling in baking dish. Bake in preheated oven until biscuits are golden and filling is bubbling. (25-30 minutes) Let rest of 5-10 minutes before serving. For enhanced flavor, use your Xtrema Ceramic Baking Dish.